Courtesy of Ken Thorley, Sun Moon Lake, Taiwan. 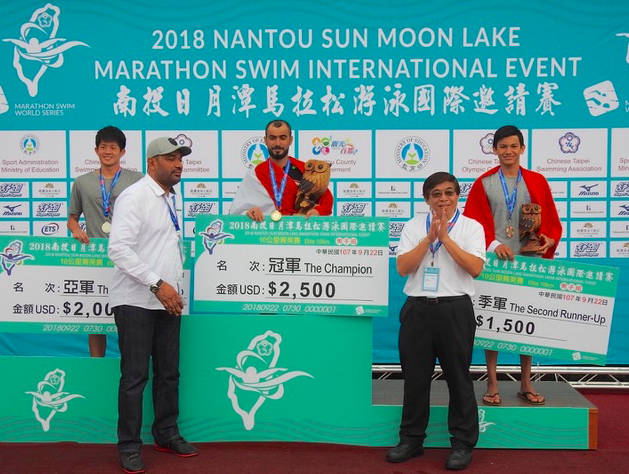 Taiwan’s 2018 Sun Moon Lake Swim was held over two consecutive weekends in September. The mass participation race with 20,000 local leisure swimmers, was held on September 15th. The international events were held the following weekend over a different course with a 2 km race, followed an hour later by the elite 10 km marathon swim. Nine national teams from around Asia flew in for the elite 10 km, which had been slated to be part of the FINA World Marathon Swimming Series this year, but was withdrawn from the series mid-year, presumably as FINA was not fully satisfied with the organization by the Chinese Taipei Swimming Association. This year’s 10 km event therefore was seen as trial run prior to anticipated inclusion in the FINA series in 2019. 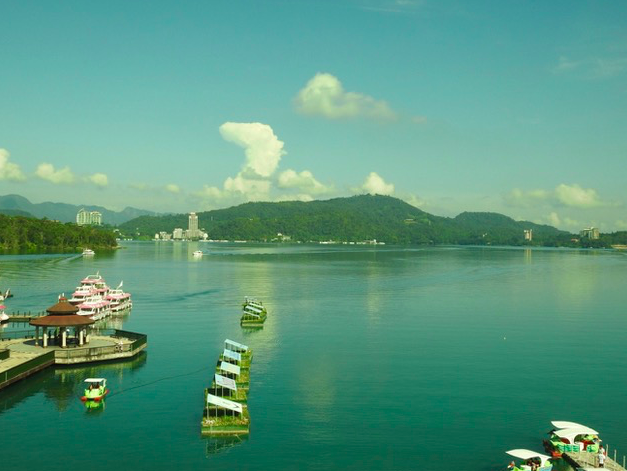 Sun Moon Lake is a stunning location; a pristine emerald green body of water surrounded by forest about 90 minutes drive from the southern Taiwanese city of Taichung. Despite their population having tragically dwindled to less than 300, the unique culture of the original inhabitants of the area, the Thao aborigines, can be seen everywhere around the race venue of Ita Thao. 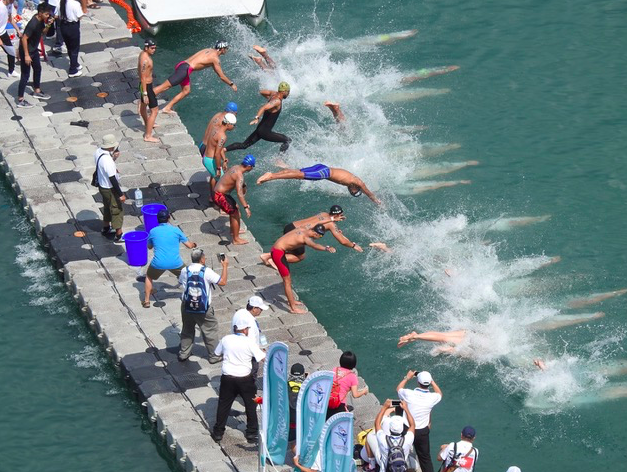 FINA technical officials were on hand to assist and monitor the 10 km race (called the Nantou Sun Moon Lake Marathon Swim International Event), ensuring it was run to FINA standards. The course plan was for five 2 km rectangular laps in the 26-27°C water, but the course was closer to a trapezoid shape which probably accounted for the slow times, which suggested the distance was more like 11 km. 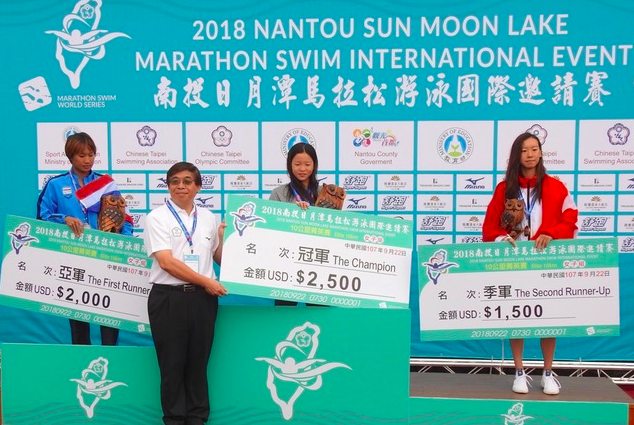 After a rather pedestrian first lap, Taiwan’s top-ranked distance swimmer, Cheng-chi Cho surged to the lead and the pace quickened appreciably as he attempted to put a gap on his rivals. Syrian 2008 Olympian and the winner of multiple Arab and Asian open water swimming titles, 32-year-old Saleh Mohammad, set out after Cho and the two leaders opened a gap to the chase pack. Cho had increased his lead over Saleh to 20 meters by the second-to-last lap before the Syrian ran his rival down with 2 km to go, eventually pulling away from the tiring Cho to win comfortably by over a minute. A tight battle was fought for third place, with 16-year-old Hong Kong swimmer Bill Thorley drafting off Taiwan’s Roger Tzu-Cheng Liao before mounting a last ditch 20m sprint to just get his hand on the wall in front of Liao and claim the bronze medal. In the women’s event, Taiwan’s Hsin-Yi Fang pulled away from Thailand’s Natthanan Junkrajang to win by 50 meters, with Hong Kong’s Rita Nip Tsz Yin third, 100 meters further back.